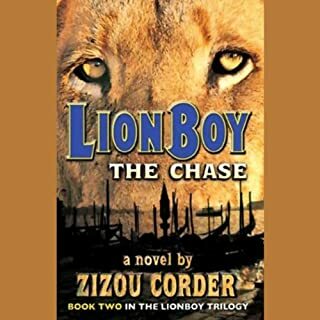 A friendly Bulgarian king, a dastardly lion tamer, a pair of kidnapped parents, a pride of lions, and a brave young boy on a mission: Together again in the second installment of the popular Lionboy series. Lionboy: The Chase was a great listen! My 12 year old son and I listen to audiobooks in the car on the way to school, we both enjoyed this continuing adventure. The story move along quickly and the developments with the characters we met in the first story keep you engaged right up to the exciting conclusion of this book! Simon Jones is one of the best narrators we have ever heard - We have enjoyed his reading of other stories and he doesnt disappoint with this one!